Sold by Neptun Trading and Fulfilled by Amazon. Gift-wrap available. Developed in conjunction with a panel of religion consultants, this indexed anthology for young readers presents more than one hundred stories from the Old and New Testaments, accompanied by more than six hundred photographs, maps, and illustrations. Sold by REAL TREASURE and ships from Amazon Fulfillment. 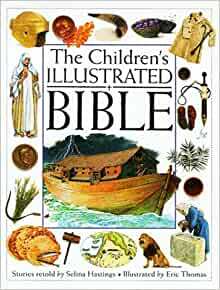 I loved these little Bibles...Beautifully Illustrated and well written for children. I purchased several to send overseas in gift boxes. I loved them so much when I got them, that I ordered two more for my grandsons. After 3 days for one and 4 days for the second the spine of the book broke and the Bible is falling apart. I was so disappointed. My Grandsons were so excited to get these books and they loved them...now they are just taped up messes in less than a week. They are not hard on books either...the boys are still using the Bible story book that my kids used as children. I worry about the ones I sent overseas now. While I like this Bible's illustrations, maps, pictures of artifacts, and the number of stories included, I cannot recommend it because the commentary reads like it's written by a non-believer. For example, in a section following the story of Paul's conversion, the commentary reads that Paul "felt that Christ appeared to him in a vision." They didn't write that Paul had a vision. They said he "felt" he'd had a vision. This is a Bible, and the commentary should affirm what the Bible says is true. Luke, the writer of Acts, states it as fact that the Lord spoke to Paul on the Road to Damascus. Paul describes it as fact that the Lord spoke to him from heaven, blinded him, and changed his name and his ways. The early church leaders believed this as do current day believers. This is just one example of how the commentary plants seeds of doubt instead of growing faith. Another example is their inclusion of information about the gnostic writings known as the "Gospel of Thomas." The excerpt says, "Early Christians had many gospels alongside the four later included in the Bible. The Gospel of Thomas...taught that believers would be saved through self knowledge..." The writers share that this "gospel" tells of a different path to salvation and that many other "gospels" were popular during the early church. It seems this information is included to cast doubt into the minds of the readers about the Gospels that were ultimately canonized. Gnosticism, the belief that all matter is evil and that all spirit is good, was denounced in its earliest forms in 2 Timothy and in 1,2,3 John. The existence of a "Gospel of Thomas" shouldn't be put forth in a way the stirs up doubt, rather if it's to be mentioned at all in a Children's Bible it should be to affirm what the other New Testament writers wrote i.e. that false teachers existed then and will continue to exist until Christ's return. Another example of the commentary seeming to want to challenge ideas put forth in the Bible: "Our idea of the Philistines comes from the writings of their enemies, the Israelites. So "Philistine" became a term of abuse for someone uncultured. Yet this Philistine strainer, decorated with a face, is finer than any Israelite pottery of the time. " There are a number of other instances where the commentary reads like it's written by a skeptic with phrases like "according to the Bible" and not a person of faith. Because of this, I wouldn't recommend this Bible. Particularly since it is geared toward young minds who are still learning to defend and guard their faith. 2.0 out of 5 starsBe aware this is a small book with teeny weeny type. TINY PRINT!!! This specific version was what my son's school said to get, and I couldn't find it at the local bookstore. I ordered it, never even thinking that it would be so small and the print miniscule. But I thought well, this is what they said to get. Then at school, another mother said she got this from Amazon and sent it back and bought it at Barnes & Noble instead because they had the bigger version. Well, heck, I'm stuck with this one AND had to buy the bigger one, too. Why they even make a book with type this small for anyone, much less beginning readers, I do not know. I am an Episcopal priest who gives out this Bible to all children who are to be baptized in the church. The stories are an engaging retelling of the scriptures that are not too watered down. While it is too advanced for infants and toddlers, it is great for grade school and older children. But I give it to the infants and toddlers and then use it as an opportunity to educated the parents. Some of them are too intimidated to read the Bible on their own. I tell them to read the full Bible so they can educate their children, but if they can't, at least read this Bible. It includes all the most important stories. The illustrations are excellent. The background information gives a richness to the material. It is through stories that Jesus taught, and so it is through stories of both the Old and New Testament, told in a compelling manner, that we learn best. The stories are colorful and short enough for children, and colorful and deep enough for adults too intimidated to read the original. As parents read to their children, they both draw closer to God. 2.0 out of 5 starsSize Matters! My daughters started at an Episcopal school this year. This was the required Bible for 1st grade. I saw the title, the author and ordered it. I wish I would have read the reviews then I would have learned it came in two sizes and Amazon doesn't carry the larger one, atleast not that I have found. I put my daughters name in it so that she could take it to school (so now I can't return it) and on the first day is when I realized the book came in two sizes and, of course, all the other children have the larger one. sigh. So I come back to Amazon, read the reviews I should have read the first time around and I really have to agree that the print is just too small for a small child and too small for her 40-something mother to read. It is full of color pictures, quality paper, binding, etc. But not a book that should have been printed in this size in the first place.